Spire Industrial Equipments Co. Gate Valve are heavy duty, outside screw & yoke type, bolted bonnet, rising stem with non rising hand wheel. Straight through bore design assures minimum turbulence, erosion and resistance to flow. The most advanced design features provides the ultimate in dependable, economic flow control. They are available in wide range of sizes and weights. These are widely suited for high pressure and temperature and variety of fluids. Bonnet : Bonnet is as cast with integral yoke up to size 8". All bonnets are precision machined with exacting tolerance as the body for exact alignment of the stem and wedge center. Body bonnet joints are fine machined for flat face or tongue & groove joint depending upon the pressure rating. Seat Ring : Renewable seats are hard faced and machined to minimize wear. The seat rings are seal welded to the body. Integral Seat is provided for Austenitic Stainless Steel valves. High Quality deposits of Stellite 6 & other hard facing alloys are assured by use of controlled preheating and automatic plasma arc facing and controlled cooling process. Wedge : One piece flexible wedge, with low stem to wedge contact, provides accurate alignment of mating surfaces. The flexibility compensates for seat distortion and ideal for processes with large temperature fluctuations. Solid wedge are also available on request for various processes. Differential hardness of 50 BHN is maintained between wedge and seat ring. Stem : Non rotating stem with precision ACME threads are machined and burnished to mirror finish to 0.8 microns for low torque. The Tee-head connections prevents lateral strain on the stem. Stem Nut : Precision machined stem nut engage the stem for accurate control of wedge position. Gland : Two piece gland for ease of alignment and exerts even pressure on the packing without binding the stem. Packing : Die Molded Grafoil rings with top and bottom braided rings provides ultimate sealing for wide range of service. Assures long packing life and avoids pitting on stem. Back Seat bush : Precision Machined bush helps for replacement of packing at open position. Eye Bolt & nut : Swing type eye bolt for ease in replacement of packing. Hand Wheel : Hand wheel are standard up to 10". Gear operator can also be given on request. 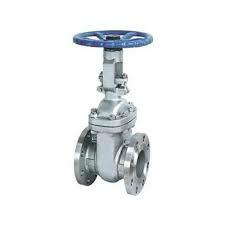 Gate Valves are adequate for all service media along with Hydrogen service, Oxygen service, Hydrocarbon service and NACE applications. Other optional features like Live loading, lantern ring, Bleed holes, purging lines and other features are available on request. Gear operator for 12" and higher is Spire standard. © Copyright 2009 - 2010. Spire Industrial Equipments Co.